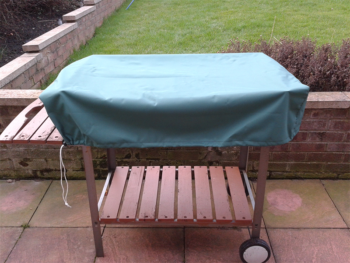 Protect your BBQ with a waterproof, breathable and colourfast cover. Comes with cord and cord locks at the base. Because this material is BREATHABLE it reduces condensation from underneath the cover it is nice and soft yet quite strong and fully waterproof especially good for wood and metals. Available in 5 colours. Maroon, Green, Navy Blue, Beige and Black. Outdoor textured polyester with breathable PU is a colourfast waterproof and breathable fabric ideal for outdoor covers or breathable storage bags. Covers are priced on the measurement total of your cover so please be accurate when submitting your measurements.